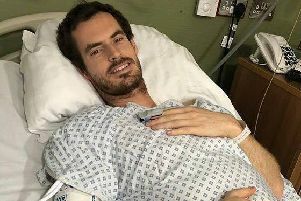 A leading hip surgeon believes Andy Murray would put himself under too much pressure if he tries to fulfil his desire to compete at Wimbledon. Murray announced before the Australian Open that he would retire this year, preferably after a final appearance at the All England Club, where he won two of his three grand slam titles. Before leaving Melbourne the 31-year-old said he was considering hip resurfacing surgery in a bid to either extend his career or improve his quality of life and revealed yesterday that he underwent the procedure in London on Monday. Mr Jon Conroy, consultant hip surgeon at Yorkshire Hip Clinic, said: “The operation involves a reshaping of the top of the femur. The ball at the top of the femur is shaped so that a metal cap can be placed on the top and fixed in place. “The socket has a metal lining as well so you have a metal on metal bearing which is tougher and allows the ball to be bigger in size, which allows a better sense of movement. “In young men, under 55, this is a good operation to have if you want to get back to doing heavy work or high fitness. He [Murray] wants to get back to active levels, whether it’s playing tennis socially or just the fact that he’s young, whereas in a standard patient there is a slightly higher risk of failure. In an older patient you would use a standard hip replacement. “He will definitely be able to play tennis again, however it’s about whether you can get back to the function of elite tennis players. Asked about the chance of competing at Wimbledon, which is due to begin on 1 July and finish two weeks later, Conroy added: “It’s a possibility. No surgeon would want to be putting that pressure on him but it would be great to see him back.